For other uses, see Merchant (disambiguation). A merchant is a person who trades in commodities produced by other people. Historically, a merchant is anyone who is involved in business or trade. Merchants have operated for as long as industry, commerce, and trade have existed. During the 16th-century, in Europe, two different terms for merchants emerged: One term, meerseniers, described local traders such as bakers, grocers, etc. ; while a new term, koopman (Dutch: koopman, described merchants who operated on a global stage, importing and exporting goods over vast distances, and offering added-value services such as credit and finance. The status of the merchant has varied during different periods of history and among different societies. In ancient Rome and Greece merchants could become wealthy, but lacked high social status. In contrast, in the Middle East, where markets were an integral part of the city,[when?] merchants enjoyed high status. In modern times, the term occasionally has been used to refer to a businessperson or someone undertaking activities (commercial or industrial) for the purpose of generating profit, cash flow, sales, and revenue utilizing a combination of human, financial, intellectual and physical capital with a view to fuelling economic development and growth. Merchants have been known for as long as humans have engaged in trade and commerce. Merchants and merchant networks operated in ancient Babylonia and Assyria, China, Egypt, Greece, India, Persia, Phoenicia and Rome. During the European medieval period, a rapid expansion in trade and commerce led to the rise of a wealthy and powerful merchant class. 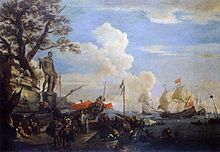 The European age of discovery opened up new trading routes and gave European consumers access to a much broader range of goods. From the 1600s, goods began to travel much further distances as they found their way into geographically dispersed market-places. Following the opening of Asia to European trade and the discovery of the New World, merchants imported goods over very long distances: calico cloth from India, porcelain, silk and tea from China, spices from India and South-East Asia and tobacco, sugar, rum and coffee from the New World. By the eighteenth century, a new type of manufacturer-merchant had started to emerge and modern business practices were becoming evident. 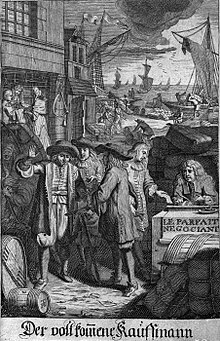 The English term, "merchant" comes from the Middle English, marchant, which itself originated from the Vulgar Latin mercatant or mercatans, formed from present participle of mercatare meaning to trade, to traffic or to deal in. The term is used to refer to any type of reseller, but can also be used with a specific qualifier to suggest a person who deals in a given characteristic such as "speed merchant" to refer to someone who enjoys fast driving; a "noise merchant", used to refer to a group of musical performers. Other known uses of the term include: "dream merchant" used to describe someone who peddles idealistic visionary scenarios and "merchant of war" to describe proponents of war. Elizabeth Honig has argued that concepts relating to the role of a merchant began to change in the mid-16th century. The Dutch term, koopman (meaning merchant), became rather more fluid during the 16th century when Antwerp was the most global market town in Europe. Two different terms, for a merchant, began to be used, meerseniers referred to local merchants including bakers, grocers, sellers of dairy products and stall-holders, while the alternate term, koopman, was used to describe those who traded in goods or credit on a large scale. This distinction was necessary to separate the daily trade that the general population understood from the rising ranks of traders who took up their places on a world stage and were seen as quite distant from everyday experience. A wholesale merchant operates in the chain between the producer and retail merchant, typically dealing in large quantities of goods. In other words, a wholesaler does not sell directly to end-users. Some wholesale merchants only organize the movement of goods rather than move the goods themselves. A retail merchant or retailer sells merchandise to end-users or consumers (including businesses), usually in small quantities. A shop-keeper is a retail merchant. However, the term 'merchant' is often used in a variety of specialised contexts such as in merchant banker, merchant navy or merchant services. Merchants have existed as long as business, trade and commerce have been conducted. 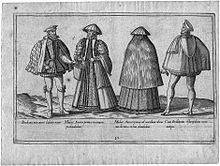 A merchant class characterized many pre-modern societies. Open air, public markets, where merchants and traders congregated, were known in ancient Babylonia and Assyria, China, Egypt, Greece, India, Persia, Phoenicia and Rome. These markets typically occupied a place in the town's centre. Surrounding the market, skilled artisans, such as metal-workers and leather workers, occupied premises in alley ways that led to the open market-place. These artisans may have sold wares directly from their premises, but also prepared goods for sale on market days. In ancient Greece markets operated within the agora (open space), and in ancient Rome the forum. Rome had two forums; the Forum Romanum and Trajan's Forum. The latter was a vast expanse, comprising multiple buildings with shops on four levels. The Roman forum was arguably the earliest example of a permanent retail shop-front. In antiquity, exchange involved direct selling through permanent or semi-permanent retail premises such as stall-holders at market places or shop-keepers selling from their own premises or through door-to-door direct sales via merchants or peddlers. The nature of direct selling centred around transactional exchange, where the goods were on open display, allowing buyers to evaluate quality directly through visual inspection. Relationships between merchant and consumer were minimal often playing into public concerns about the quality of produce. The Phoenicians were well known amongst contemporaries as "traders in purple" – a reference to their monopoly over the purple dye extracted from the murex shell. The Phoenicians plied their ships across the Mediterranean, becoming a major trading power by the 9th century BCE. 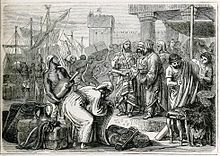 Phoenician merchant traders imported and exported wood, textiles, glass and produce such as wine, oil, dried fruit and nuts. Their trading skills necessitated a network of colonies along the Mediterranean coast, stretching from modern day Crete through to Tangiers and onto Sardinia. The Phoenicians not only traded in tangible goods, but were also instrumental in transporting the trappings of culture. The Phoenician's extensive trade networks necessitated considerable book-keeping and correspondence. In around 1500 BCE, the Phoenicians developed a phonetic alphabet which was much easier to learn that the pictographic scripts used in ancient Egypt and Mesopotamia. Phoenician traders and merchants were largely responsible for spreading their alphabet around the region. Phoenician inscriptions have been found in archaeological sites at a number of former Phoenician cities and colonies around the Mediterranean, such as Byblos (in present-day Lebanon) and Carthage in North Africa. Mosaic showing garum container, from the house of Umbricius Scaurus of Pompeii. The inscription which reads "G(ari) F(los) SCO(mbri) SCAURI EX OFFI(CI)NA SCAURI" has been translated as "The flower of garum, made of the mackerel, a product of Scaurus, from the shop of Scaurus"
The social status of the merchant class varied across cultures; ranging from high status (the members even eventually achieving titles such as that of Merchant Prince or Nabob) to low status, as in China, Greece and Roman cultures, owing to the presumed distastefulness of profiting from "mere" trade rather than from labor or the labor of others as in agriculture and craftsmanship. The Romans defined merchants or traders in a very narrow sense. Merchants were those who bought and sold goods while landowners who sold their own produce were not considered to be merchants. Being a landowner was a 'respectable' occupation. On the other hand, the trade of merchant was not considered 'respectable'. 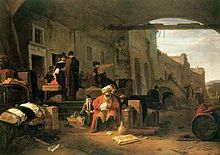 In the ancient cities of the Middle East, where the bazaar was the city's focal point and heartbeat, merchants who worked in bazaar were considered to be among the high-ranking members of the society. Medieval attitudes toward merchants in the West were strongly influenced by criticism of their activities by the Christian church, which closely associated their activities with the sin of usury. In Greco-Roman society, merchants typically did not have high social status, though they may have enjoyed great wealth. Umbricius Scauras, for example, was a manufacturer and trader of fish sauce (also known as garum) in Pompeii, circa 35 C.E. His villa, situated in one of the wealthier districts of Pompeii, was very large and ornately decorated in a show of substantial personal wealth. Mosaic patterns in the floor of his atrium were decorated with images of amphora bearing his personal brand and bearing quality claims. One of the inscriptions on the mosaic amphora reads "G(ari) F(los) SCO[m]/ SCAURI/ EX OFFI[ci]/NA SCAU/RI" which translates as "The flower of garum, made of the mackerel, a product of Scaurus, from the shop of Scaurus." The reputation of Scauras' fish sauce was known to be of very high quality across the Mediterranean and its reputation travelled as far away as modern southern France. Other notable Roman merchants include: Marcus Julius Alexander, Sergius Orata and Annius Plocamus. In the Roman world, local merchants served the needs of the wealthier landowners. While the local peasantry, who were generally poor, relied on open air market places to buy and sell produce and wares, major producers such as the great estates were sufficiently attractive for merchants to call directly at their farm-gates. The very wealthy landowners managed their own distribution, which may have involved exporting. Markets were also important centres of social life and merchants helped to spread news and gossip. The nature of export markets in antiquity is well documented in ancient sources and archaeological case studies. Both Greek and Roman merchants engaged in long-distance trade. A Chinese text records that a Roman merchant named Lun reached southern China in 226 CE. Roman objects, dating from the period 27 BCE to 37 CE, have been excavated in sites as far afield as the Kushan and Indus ports. The Romans sold purple and yellow dyes, brass and iron and acquired incense, balsalm, expensive liquid myrrh and spices from the Near East and India, fine silk from China and fine white marble destined for the Roman wholesale market from Arabia. For Roman consumers, the purchase of goods from the East was a symbol of social prestige. Medieval England and Europe witnessed a rapid expansion in trade and the rise of a wealthy and powerful merchant class. Blintiff has investigated the early Medieval networks of market towns and suggests that by the 12th century there was an upsurge in the number of market towns and the emergence of merchant circuits as traders bulked up surpluses from smaller regional, different day markets and resold them at the larger centralised market towns. Peddlers or itinerant merchants filled any gaps in the distribution system. 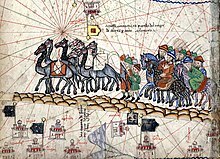 From the 11th century, the Crusades helped to open up new trade routes in the Near East, while the adventurer and merchant, Marco Polo stimulated interest in the far East in the 12th and 13th centuries. Medieval merchants began to trade in exotic goods imported from distant shores including spices, wine, food, furs, fine cloth (notably silk), glass, jewellery and many other luxury goods. Market towns began to spread across the landscape during the medieval period. Merchant guilds began to form during the Medieval period. A fraternity formed by the merchants of Tiel in Gelderland (in present-day Netherlands) in 1020 is believed to be the first example of a guild. The term, "guild" was first used for gilda mercatoria to describe a body of merchants operating out of St. Omer, France in the 11th century and London's Hanse was formed in the 12th century. These guilds controlled the way that trade was to be conducted and codified rules governing the conditions of trade. Rules established by merchant guilds were often incorporated into the charters granted to market towns. In the early 12th century, a confederation of merchant guilds, formed out the German cities of Lubeck and Hamburg, known as "The Hanseatic League" came to dominate trade around the Baltic Sea. By the 13th and 14th centuries, merchant guilds had sufficient resources to have erected guild halls in many major market towns. During the thirteenth century, European businesses became more permanent and were able to maintain sedentary merchants and a system of agents. Merchants specialised in financing, organisation and transport while agents were domiciled overseas and acted on behalf of a principal. These arrangements first appeared on the route from Italy to the Levant, but by the end of the thirteenth century merchant colonies could be found from Paris, London, Bruges, Seville, Barcelona and Montpellier. Over time these partnerships became more commonplace and led to the development of large trading companies. These developments also triggered innovations such as double-entry book-keeping, commercial accountancy, international banking including access to lines of credit, marine insurance and commercial courier services. These developments are sometimes known as the commercial revolution. Luca Clerici has made a detailed study of Vicenza’s food market during the sixteenth century. He found that there were many different types of merchants operating out of the markets. For example, in the dairy trade, cheese and butter was sold by the members of two craft guilds (i.e., cheesemongers who were shopkeepers) and that of the so-called ‘resellers’ (hucksters selling a wide range of foodstuffs), and by other sellers who were not enrolled in any guild. Cheesemongers’ shops were situated at the town hall and were very lucrative. Resellers and direct sellers increased the number of sellers, thus increasing competition, to the benefit of consumers. Direct sellers, who brought produce from the surrounding countryside, sold their wares through the central market place and priced their goods at considerably lower rates than cheesemongers. 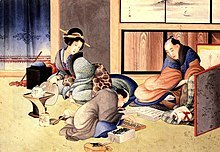 A merchant making up the account by Katsushika Hokusai. From 1300 through to the 1800s a large number of European chartered and merchant companies were established to exploit international trading opportunities. The Company of Merchant Adventurers of London, chartered in 1407, controlled most of the fine cloth imports while the Hanseatic League controlled most of the trade in the Baltic Sea. A detailed study of European trade between the thirteenth and fifteenth century demonstrates that the European age of discovery acted as a major driver of change. In 1600, goods travelled relatively short distances: grain 5–10 miles; cattle 40–70 miles; wool and wollen cloth 20–40 miles. However, in the years following the opening up of Asia and the discovery of the New World, goods were imported from very long distances: calico cloth from India, porcelain, silk and tea from China, spices from India and South-East Asia and tobacco, sugar, rum and coffee from the New World. In Mesoamerica, a tiered system of traders developed independently. The local markets, where people purchased their daily needs were known as tianguis while pochteca was the term used to describe long-distance, professional merchants traders who obtained rare goods and luxury items desired by the nobility. This trading system supported various levels of pochteca – from very high status merchants through to minor traders who acted as a type of peddler to fill in gaps in the distribution system. The Spanish conquerors commented on the impressive nature of the local and regional markets in the 15th century. The Mexica (Aztec) market of Tlatelolco was the largest in all the Americas and said to be superior to those in Europe. The modern era is generally understood to refer to period that coincides with the rise of consumer culture in seventeenth and eighteenth century Europe. As standards of living improved in the 17th century, consumers from a broad range of social backgrounds began to purchase goods that were in excess of basic necessities. An emergent middle class or bourgeosie stimulated demand for luxury goods and the act of shopping came to be seen as a pleasurable pass-time or form of entertainment. As Britain embarked on colonial expansion, large commercial organisations were much in need of sophisticated information about trading conditions in foreign lands. Daniel Defoe, a London merchant, published information on trade and economic resources of England, Scotland and India. Defoe was a prolific pamphleteer and among his many publications are titles devoted to trade including; Trade of Britain Stated, 1707; Trade of Scotland with France, 1713; The Trade to India Critically and Calmly Considered, 1720 and A Plan of the English Commerce 1731; all pamphlets that were highly popular with contemporary merchants and business houses. By the eighteenth century, a new type of manufacturer-merchant was emerging and modern business practices were becoming evident. Many merchants held showcases of goods in their private homes for the benefit of wealthier clients. Samuel Pepys, for example, writing in 1660, describes being invited to the home of a retailer to view a wooden jack. McKendrick, Brewer and Plumb found extensive evidence of eighteenth century English entrepreneurs and merchants using 'modern' marketing techniques, including product differentiation, sales promotion and loss leader pricing. English industrialists, Josiah Wedgewood and Matthew Boulton, are often portrayed as pioneers of modern mass marketing methods. Wedgewood was known to have used marketing techniques such as direct mail, travelling salesmen and catalogues in the eighteenth century. Wedgewood also carried out serious investigations into the fixed and variable costs of production and recognised that increased production would lead to lower unit costs. He also inferred that selling at lower prices would lead to higher demand and recognised the value of achieving scale economies in production. By cutting costs and lowering prices, Wedgewood was able to generate higher overall profits. Similarly, one of Wedgewood's contemporaries, Matthew Boulton, pioneered early mass production techniques and product differentiation at his Soho Manufactory in the 1760s. He also practiced planned obsolescence and understood the importance of "celebrity marketing" – that is supplying the nobility, often at prices below cost and of obtaining royal patronage, for the sake of the publicity and kudos generated. Both Wedgewood and Boulton staged expansive showcases of their wares in their private residences or in rented halls. Eighteenth-century American merchants, who had been operating as importers and exporters, began to specialise in either wholesale or retail roles. They tended not to specialise in particular types of merchandise, often trading as general merchants, selling a diverse range of product types. These merchants were concentrated in the larger cities. They often provided high levels of credit financing for retail transactions. Elizabeth Honig has argued that artists, especially the Dutch painters of Antwerp, developed a fascination with merchants from the mid-16th century. At this time, the economy was undergoing profound changes – capitalism emerged as the dominant social organisation replacing earlier modes of production. Merchants were importing produce from afar – grain from the Baltic, textiles from England, wine from Germany and metals from various countries. Antwerp was the centre of this new commercial world. The public began to distinguish between two types of merchant, the meerseniers which referred to local merchants including bakers, grocers, sellers of dairy products and stall-holders, and the koopman, which described a new, emergent class of trader who dealt in goods or credit on a large scale. With the rise of a European merchant class, this distinction was necessary to separate the daily trade that the general population understood from the rising ranks of traders who operated on a world stage and were seen as quite distant from everyday experience. The wealthier merchants also had the means to commission artworks with the result that individual merchants and their families became important subject matter for artists. For instance, Hans Holbein, the younger painted a series of portraits of Hanseatic merchants working out of London's Steelyard in the 1530s. These included including Georg Giese of Danzig; Hillebrant Wedigh of Cologne; Dirk Tybis of Duisburg; Hans of Antwerp, Hermann Wedigh, Johann Schwarzwald, Cyriacus Kale, Derich Born and Derick Berck. Paintings of groups of merchants, notably officers of the merchant guilds, also became subject matter for artists and documented the rise of important mercantile organisations. In recent art: Dutch photographer Loes Heerink spend hours on bridges in Hanoi to take pictures of Vietnamese street Merchants. She published a book called Merchants in Motion: the art of Vietnamese Street Vendors. Sir Thomas Gresham by Anthonis Mor, c. 1560. ^ Shaw, Eric H. (2016). "2: Ancient and medieval marketing". In Jones, D.G. Brian; Tadajewski, Mark (eds.). The Routledge Companion to Marketing History. Routledge Companions. London: Routledge. p. 24. ISBN 9781134688685. Retrieved 2017-01-03. Perhaps the only substantiated type of retail marketing practice that evolved from Neolithic times to the present was the itinerant tradesman (also known as peddler, packman or chapman). These forerunners of travelling salesmen roamed from village to village bartering stone axes in exchange for salt or other goods (Dixon, 1975). ^ Daniels (1996) p. 94–95. ^ "Decameron Web – Society". Brown.edu. Archived from the original on 28 April 2013. Retrieved 8 February 2017. ^ Barnish, S.J.B. (1989) "The Transformation of Classical Cities and the Pirenne Debate", Journal of Roman Archaeology, Vol. 2, p. 390. ^ Clerici, L., "Le prix du bien commun. Taxation des prix et approvisionnement urbain (Vicence, XVIe-XVIIe siècle)" [The price of the common good. Official prices and urban provisioning in sixteenth and seventeenth century Vicenza] in I prezzi delle cose nell’età preindustriale /The Prices of Things in Pre-Industrial Times, [forthcoming], Firenze University Press, 2017. ^ "Merchant Adventurers" in Encyclopædia Britannica, Online Library Edition, 2013. Retrieved 22 July 2013. ^ Rebecca M. Seaman, ed. (2013-08-27). Conflict in the Early Americas: An Encyclopedia of the Spanish Empire's Aztec, Incan and Mayan Conquests. p. 375. ISBN 9781598847772. ^ McKendrick, N., Brewer, J. and Plumb . J.H., The Birth of a Consumer Society: The Commercialization of Eighteenth Century England, London, 1982. Thrupp, Sylvia L. (1989). The Merchant Class of Medieval London, 1300-1500. University of Michigan Press. ISBN 978-0-472-06072-6.